QMS’ digitisation of Sydney shows no signs of slowing down with the launch of two landmark digital billboards this week. Towering above the major four-way intersection of General Holmes Drive and Joyce Avenue, ‘The Kingsford’ is the largest digital billboard to impact this highly-sought after audience as they leave the precinct, taking advantage of the recent road changes to ensure exceptional impact, uncluttered viewing and extended dwell times for those travelling past. It’s situated at a key entry/exit point and the large-scale billboard provides advertisers with a commanding platform to engage with both inbound and outbound domestic as well as international travellers and the elite business audience utilising the corporate aviation and helicopter zone. QMS is complementing this by providing advertisers with the ability to target young professionals and families in the heart of the inner west with ‘The Victoria’. It’s located on the highly sought-after Victoria Road, in the affluent suburb of Rozelle, this landmark digital billboard impacts heavy volumes of traffic travelling to the CBD and surrounding inner-city suburbs. 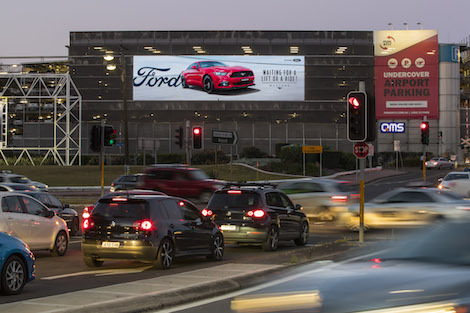 The launch of these iconic sites represents an impressive addition to QMS’ digital portfolio and further cements the leading outdoor media company’s rapid expansion throughout Sydney. Inaugural advertisers on the ‘The Kingsford’ include Ford and Domain and on ‘The Victoria’ Network 10 and Foxtel. This entry was posted on Tuesday, September 5th, 2017 at 08:21 @389 and is filed under DailyDOOH Update. You can follow any responses to this entry through the RSS 2.0 feed. You can leave a response, or trackback from your own site.